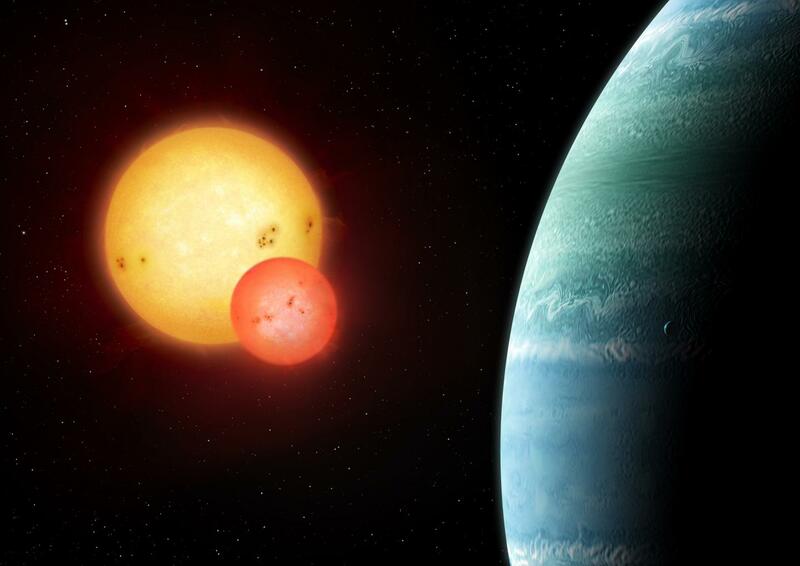 A team of astronomers including a San Francisco State University researcher has discovered a new planet orbiting a pair of stars, the 10th "circumbinary" planet discovered by NASA's Kepler Mission and a milestone for the 6-year-old spacecraft. The planet, known as Kepler-453b, is located within its host stars' "habitable zone," the area around the stars in which life could potentially exist. And the somewhat fortuitous nature of its discovery indicate there could be more like it than previously believed, according to Stephen Kane, an assistant professor of physics and astronomy at San Francisco State University and member of the team that made the discovery. "If we had observed this planet earlier or later than we did, we would have seen nothing and assumed there was no planet there," Kane said. "That suggests that there are a lot more of these kinds of planets than we are thinking, and we're just looking at the wrong time." The discovery is detailed in an article accepted for publication in the Astrophysical Journal and will be announced by San Diego State University Professor William Welsh on Friday at the International Astronomical Union meeting in Honolulu. Researchers typically detect "exoplanets" -- planets outside our solar system -- by observing the decrease in starlight as the planet passes, or "transits," between its host star and Earth. This method is known as the "transit method." But because Kepler-453b is affected by the gravitational pull of two stars, not just one, its orbit is more erratic -- "like a spinning top," said Kane. As a result, its transits are only visible to astronomers 9 percent of the time. In fact, had researches not detected the planet now, their next chance to do so would not have come until 2066. "It's amazing how fortunate we were in catching it at the right time," Kane said. "It's a good reminder that there's always a value in checking again." Kepler-453b blocked 0.5 percent of its host stars' light during the transit, which enabled researchers to calculate that the planet's radius is 6.2 times that of Earth, or about 60 percent larger than Neptune. Its size indicates it is a gas giant, rather than a rocky planet, and thus unable to have life despite being in the habitable zone. "But it could have moons that are rocky, which means you could have life on the moons in this system," Kane said. Any inhabitants of the system would see two suns in their sky -- much like the view from the planet Tatooine in the movie "Star Wars" -- orbiting each other every 27 days. The larger star is about 94 percent the size of our sun, the smaller star only 20 percent the size of our sun and much cooler, emitting less than 1 percent of the larger star's energy. Kepler-453b takes 240 days to orbit its host stars. "We didn't know circumbinary systems could exist until Kepler came along, and since then we've been finding them in larger numbers," Kane said. The first two-star system was discovered by the Kepler Mission in 2011. Kane is the head of NASA's Kepler Habitable Zone Working Group and in 2014 was part of an international team that detected Kepler-186f, a rocky planet that may have liquid water on its surface. He continues a long tradition of "planet hunting" at SF State that began in 1996, when Professor Geoffrey Marcy and graduate student Paul Butler became the first Americans to locate a planet outside the solar system. Since then, SF State faculty and students have discovered more than 500 exoplanets, including more than 100 by Kane. "Being involved in these discoveries never gets old," Kane said. "We live in an amazing time in which we have the technology to measure objects hundreds of light-years away and answer some of the questions about the universe that humans have asked for ages. It's incredible to be a part of that." Astronomers discover a tenth transiting "Tatooine"